Flexible ducting is what transports heated or cooled air from your home through fans, grilles or diffusers. It’s nifty stuff – inexpensive and easy to maneuver and weave in tight spaces. The performance of your ventilation is hugely impacted by the installation of your ducting system. 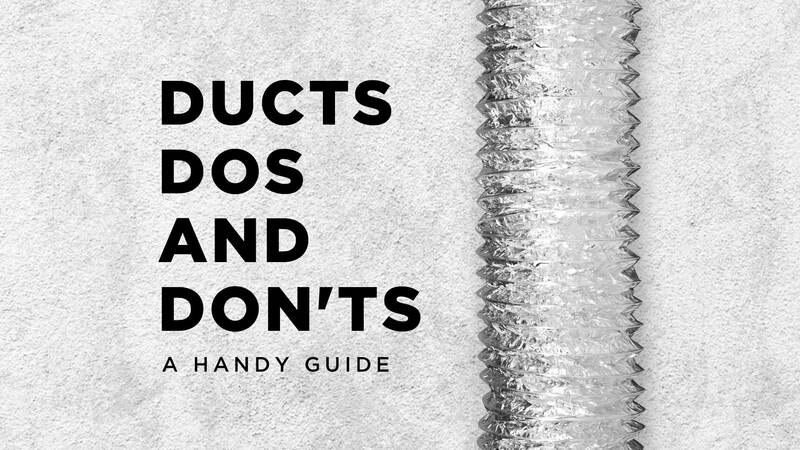 That’s why we’ve created this list of duct do’s and don’ts for your ducting so you always have efficient, powerful airflow. Friction and airflow don’t mix. When flexible duct has been cut with extra length to spare, the air has to travel further than is necessary and it’s exposed to much more of the duct surface area which in turn creates friction. Cutting your flexible duct precisely to size may take a few extra minutes of measuring but your airflow will be much smoother and efficient as a result. Having slack in duct reduces your overall airflow. When duct is slack, it creates a lot of unnecessary bends. All of the the wire ribs aren’t stretched taut which creates friction for airflow. Regardless of the area, make sure that your flexible duct is stretched all the way out. Take some time to look at the space you’re installing to ensure there are no areas where duct can slack, such as hanging over a loft beam. Sharp bends and turns in flexible ducting reduces airflow. The more turns and kinks in the line, the more your airflow is compromised. When possible, make sure that there are no sharp bends. We know that sometimes bends can’t be avoided depending on the structure you’re ducting. If so, make sure that the radius of any turn that you’re adding is at least the same dimension as the duct diameter. Securing the duct to a fan spigot the wrong way can restrict airflow. Always make sure to pick the right size duct for the spigot so that the diameters are the same; Ie. if your fan spigot is 150mm in diameter, you should use the 150mm duct. Always make sure to slip the duct over the spigot and tape or clamp it in to place to optimise the airflow. It’s important to follow these guidelines when installing ducting in your home to make sure air is free of friction and flowing efficiently. Keep your eyes peeled for more tips and tricks about keeping your ventilation performance at its peak on our blog. If there’s anything you want to know about, drop us a message on Facebook, Twitter, LinkedIn or Instagram. In the meantime, if you think your ventilation system isn’t operating to the best of its abilities, get in touch with us now for some troubleshooting and advice. Ventilation at the click of a button!